Pan fried salmon is probably one of those dishes that everyone has made at some point. I came across this technique from Gordon Ramsay the other and wanted to give it a try. The main idea here is to score the salmon before cooking on the skin side, so that the salmon won’t curl while cooking. 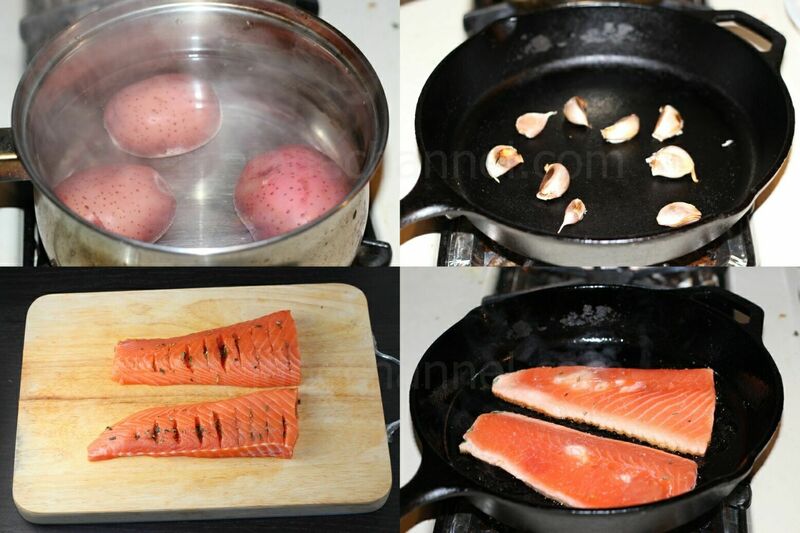 This ensures an evenly cooked piece of salmon and enables extra crispiness as the salmon has better contact with the pan and is more directly cooked. By rubbing in some salt and rosemary into the cuts, it is also possible to get in some extra flavor in the salmon. You will notice from the pictures that the piece of salmon that was used already had the skin removed, which took away a lot of the crispiness that would have made it even better. However, I do think this is a sound technique and I would for sure try it again with skin-on salmon next time! 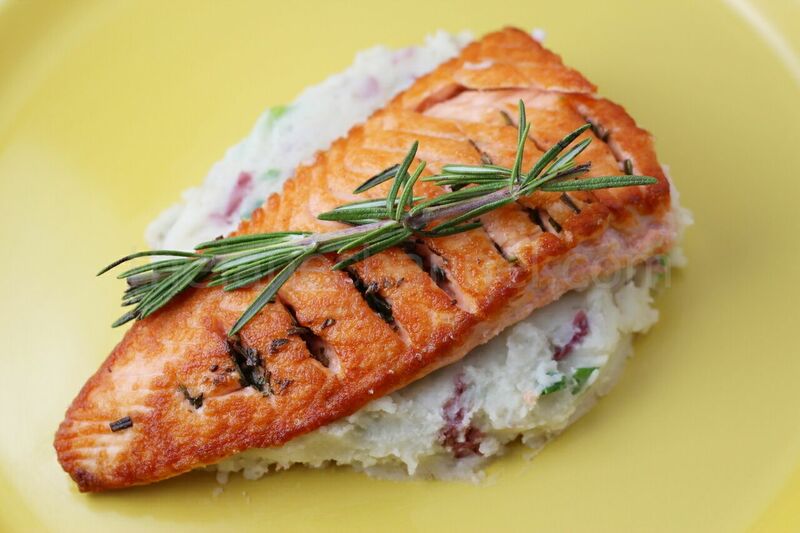 I paired the salmon with some mashed potatoes, and it made for a great Saturday night dinner. With the skin side facing out, score the skin crosswise in parallel lines to about halfway deep in the filet. Scoring the salmon filet prevents it from curling while cooking, ensuring it’s cooked nice and evenly. Open each score and sprinkle salt and rosemary into the cut. Glaze the top of the salmon filet with olive oil. Heat oil in a heavy skillet over medium heat. Add salmon, skin side down, as soon as the oil begins to lightly smoke. Keep your fingers on top of the salmon filet for a bit to keep it nice and flat. Watch the side of the piece of salmon for color changes. When 2/3 of the salmon has turned opaque, flip it to the other side and cook until it’s done. Wash and scrub potatoes until very clean. This is important as we will be eating the skin. In the meantime, take the head of garlic and remove the outermost portions of the skin (but leave the skin of the individual cloves intact). Lightly oil, wrap in aluminum foil, and bake at 400 degrees in the oven fro about 30 minutes. If you would not like to use the oven, put cloves in a heated heavy skillet and cook under lowest heat possible, covered, for about 30 minutes. Makes sure to flip the garlic once in a while to keep it from burning. The garlic should be very soft at this point, squeeze the meat out from the skins. Once potatoes are fully cooked (when a fork pokes through the potato without much effort), drain the water and place in a large bowl. Combine with butter, garlic cloves, chopped scallion, and salt to taste. Mash with a fork. Add in a bit of half and half and keep mashing and mixing. Once it is completely mixed, add a bit more. The idea is not to add in too much at a time as that would break the mixture too much.